I'm going to kick off this post with an admission: I am not a fan of peppers. Never have been, probably never will be. Sure, they make it into my Gazpacho or my Shredded Steak Tacos, but you won't really see me featuring a peppers-heavy dish. That is, until now. See, my parents are huge fans of stuffed peppers. And, whenever I go to visit, I try to cook up some food for them. My father has Parkinson's and my mom is his primary caretaker—I like to bring them tasty, nutritious, protein-heavy (important for boosting my father's strength), comfort meals that are easily reheated. When I saw a stuffed pepper soup on Aunt Bee's Recipes, I felt inspired to do my own take on the hearty, one-pot meal. 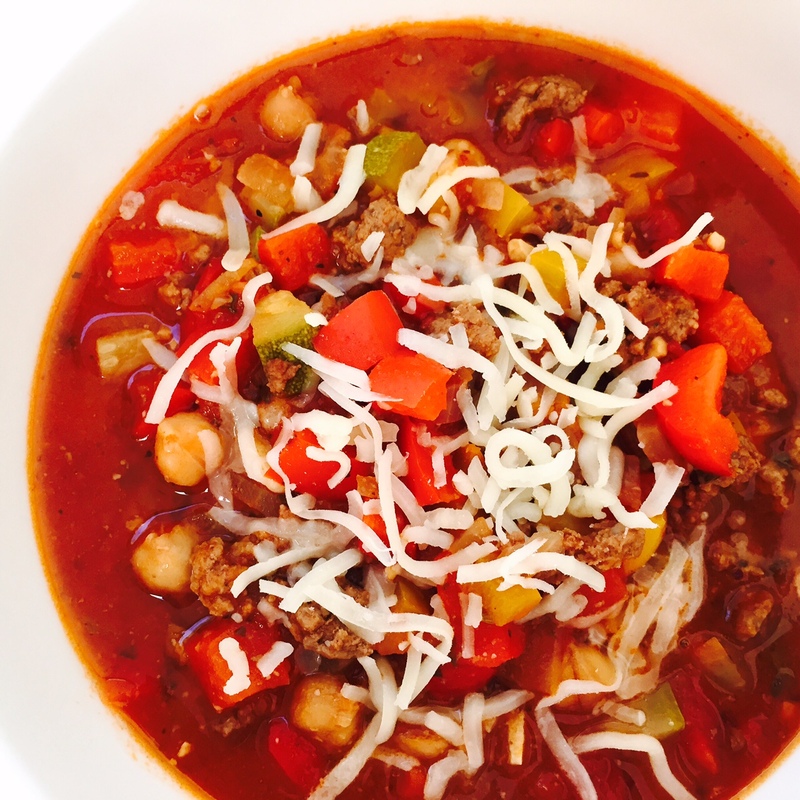 For many of the same reasons that this soup is great for my dad, it's also wonderful for new moms as they recover from childbirth. This budget-friendly dish is loaded with Vitamin C (crucial for healing) from the peppers, zucchini and tomato sauce. The meat and beans provide iron—important after the blood loss of childbirth—and protein, which is vital for rebuilding strength. Plus, this soup freezes and reheats well. Whether you're stocking your own freezer during your pregnancy, or bringing food to a friend that's recently given birth, this is a great dish to make. Of course, you can cook up this pot of soup in just about 30 minutes. It's an easy weeknight meal for anyone, especially perfect now that the kiddos are headed back to school! Over medium-high heat put the olive oil in a soup pot until hot. Add the beef and onions, as well as some salt and pepper. Once the beef is no longer pink (about five minutes), add the peppers, zucchini, garlic, and red wine. Simmer for about 15 minutes. Turn off the heat and stir in the grated Parmesan cheese. Taste and add more salt and pepper, if needed. Serve with additional grated cheese, or perhaps a slice of fresh mozzarella. I used a shredded Italian cheese blend of Fontina, Asiago, Parmesan and Provolone that I found at Trader Joe's and it was wonderful on this soup! For another great dish to bring to a new mom, try this Spicy Meatball Orzo Soup! What delicious dishes do you like to bring to new parents or to people recovering from an illness? This soup looks so delicious! I can't wait to try it! Oh my goodness! This looks absolutely wonderful! My family will love it! Looks delicious, I just love stuffed peppers! I can wait for it to cool off a bit around these parts. I love soup any time of the year. Such great flavors here. Thanks for the recipe! Yum! I love soup. 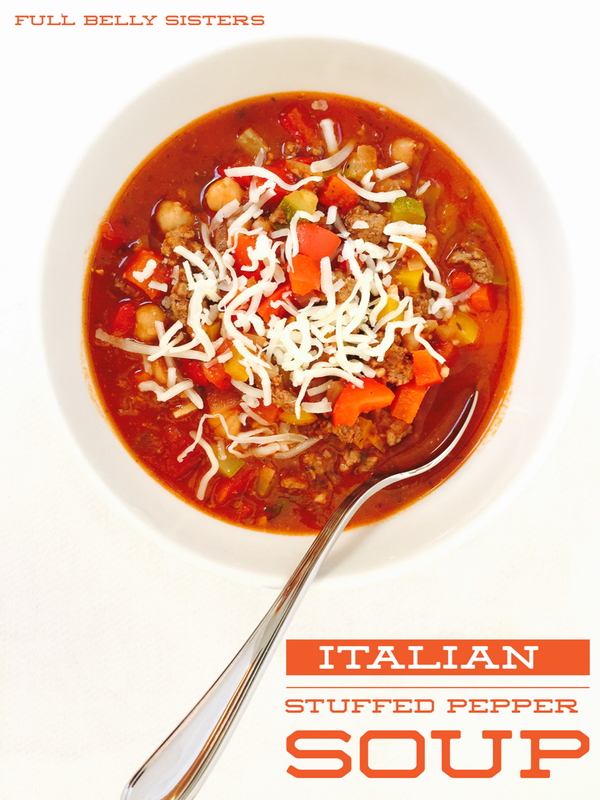 This Italian stuffed pepper soup looks wonderful! Fall is right around the corner, so soup season is coming! I now have to stop everything and go and get something to eat, I am starving looking at this, I sure wish I had a bowl!! But, seriously, glad my post made you crave some good food. Please can you pass me a bowl through the computer for my lunch? LOL, I would if I could! I love peppers and really like the recipe you created. I'm so excited to try this! We do love peppers in our house and I know my family will love this! Hi Justine! This looks beautiful! 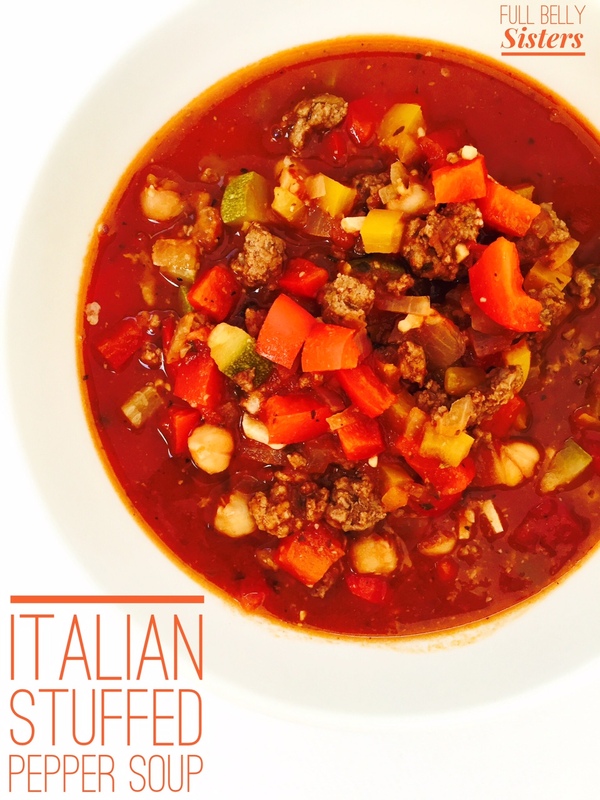 Can you fedex a piping hot bowl of this italian stuffed pepper soup to me please? We made this this weekend and it was ah-maxing. I could eat it every day! One of my new favorites. Thanks so much for trying it AND for coming back to post a review! This is going in my fall/winter rotation. YUM!! Easy too. Thank you! !